Upside Down Magic is a fantastic story of a girl who has to accept her talent, when her magic kicks in on her 5th grade birthday. There are different kinds of magics-5 F's. Nory is a fluxer, she is not like normal fluxers because she has upside down magic. The other members of the Upside Down Magic class have to remind other normal kids to call their magic different/unusual or UPSIDE DOWN. 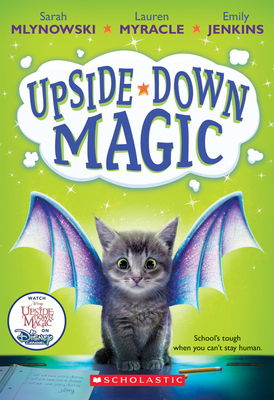 Upside-Down Magic is a fantastic story of a girl who has to accept her talent, when her magic kicks in on her 5th grade birthday. There are different kinds of magic - 5F's. Nory is a fluxer, she is not like normal fluxers because she has upside down magic. The other members of the Upside Down Magic class have to remind other normal kids to call their magic different/unusual or UPSIDE DOWN! It's never easy when your magic goes wonky. For Nory, this means that instead of being able to turn into a dragon or a kitten, she turns into both of them at the same time -- a dritten. For Elliott, the simple act of conjuring fire from his fingertips turns into a fully frozen failure. For Andres, wonky magic means he's always floating in the air, bouncing off the walls, or sitting on the ceiling. For Bax, a bad moment of magic will turn him into a . . . actually, he'd rather not talk about that. Nory, Elliott, Andres, and Bax are just four of the students in Dunwiddle Magic School's Upside-Down Magic class. In their classroom, lessons are unconventional, students are unpredictable, and magic has a tendency to turn wonky at the worst possible moments. Because it's always amazing, the trouble a little wonky magic can cause . . .